5/7/12. 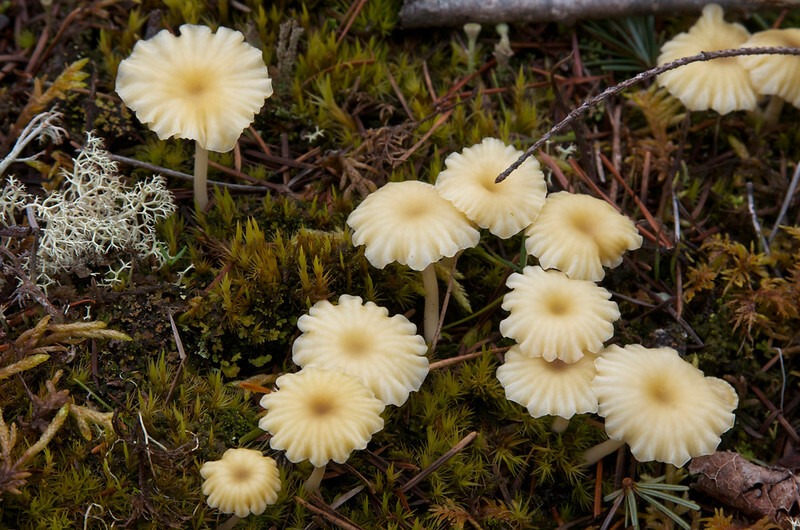 This weekend we came across these delicate forest mushrooms on a hike along the spine of the Sechelt Pennisula, BC. Much of this area is Crown land and is still actively logged. This happens to be one area that has been set aside and has a combination of forested wetlands and open pine balds upon which these fungi were growing. Not sure of the species so any help on identifying would be welcome! Thank you for your many kind comments on the Texada Island sunset photo yesterday. What a great find and nicely captured. Wonderful shot! I thought they were flowers at first! What a wonderful find. Such beautiful mushrooms; so delicate & such a lovely capture of them. Thank you for your intelligent & insightful comments. Your work is wonderful! A delightful find, they're so pretty and very uniform, they must be pretty new with no brown and no tears. I love the way the edges are trying so hard to look like flowers and getting pretty darn close! Great timing and great eye! Very nice looking mushrooms. Well done.